At last the GTS, Citibank Nigeria Ltd project is over. A funny feeling comes over me as I take time to decompress from the tight schedule I have been under these past five weeks. I feel really relieved to have put it behind me. Below is the initial design for the CD cover for the project; I later went for something simpler. 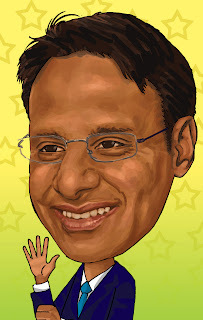 And next is the portrait of the GTS boss Mr. Nanji. It was a learning experience. Now it's time to wrap up some loose ends for the year 2009.